The visionary Mayor of Auckland has taken to describing his domain as “a city in a forest”. It’s a lovely idea and from what markontour saw on a brief work visit it is not far off being realised. 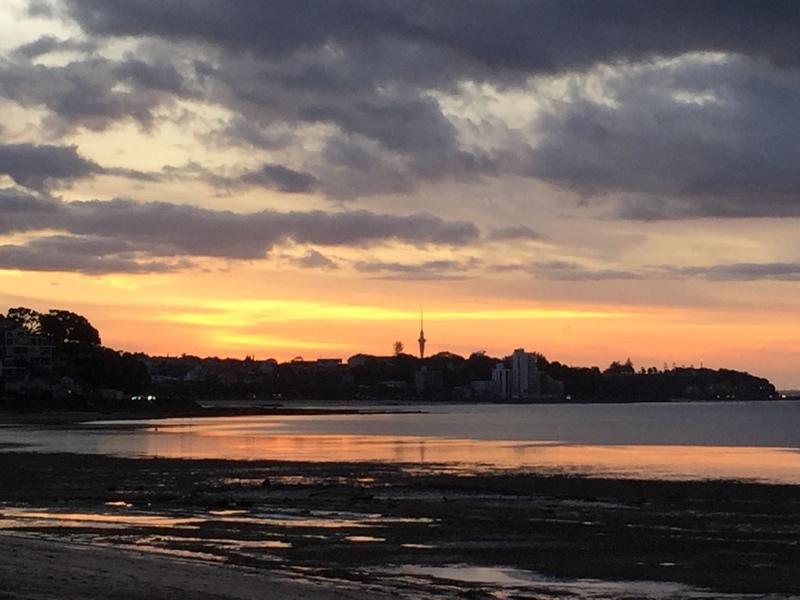 So while Auckland has its challenges, particularly constraining the urban sprawl that comes from the New Zealand dream of a single-storey house and half an acre for everyone, the great attraction of this growing city is its proximity to the natural world beyond. First settled in 1350 by Maori arriving in canoes from Polynesia and named Tamaki Makaurau, the land was sold to one Joseph Brooks Weller for a cask of gunpowder in 1832. Today it is easily New Zealand’s largest city, with a swelling 1.6 million population. It still feels like a new and not yet finished town, with cranes visible from all angles and a massive redevelopment of the harbour underway. Markontour’s trip to Auckland was brief so these are preliminary notes which, hopefully, will soon be enhanced by a return trip. 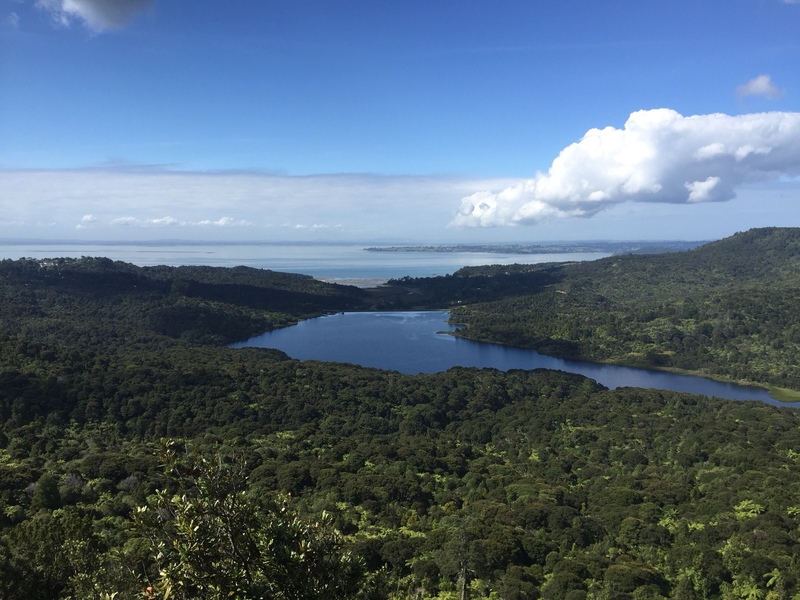 It might seem odd to start a city review with ruminations on a nature reserve, but Waitakere is barely twenty minutes from the centre of Aukland and must surely be one of its chief attractions. With stunning views of the Manukau Bay, a rainforest walk, and some striking Pou (a totemic Maori sculpture, which pays respect to local ancestors, including ‘The Navigator’ who brought the Maori to Waitakere), it’s a place to relax. There’s also an impressive Arataki visitor centre, where I learned that a whole load of plants that Europeans strive to grow in their back gardens are considered weeds out here – from Periwinkle and English Ivy to the humble blackberry. 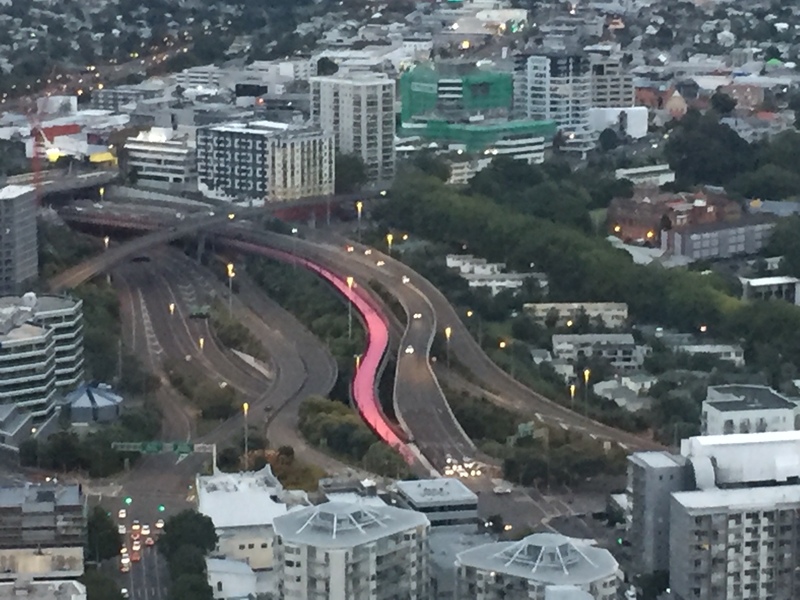 The new Te Ara I Whiti (“Lightpath”) is a neon-pink cycle and pedestrian bridge that you can see from the sky. Connecting parts of the centre previously segregated by a highway, the bold colours make this a statement of intent to support cyclists, in a city previously designed for the car. The Panuku Development (meaning “to move forward”) is an ambitious 18ha regeneration project on Auckland’s waterfront. While a working docks remain in-situ on the other side of the central business district, here old wharehouses are being converted into high density living, hotels, and lots of great shared space. 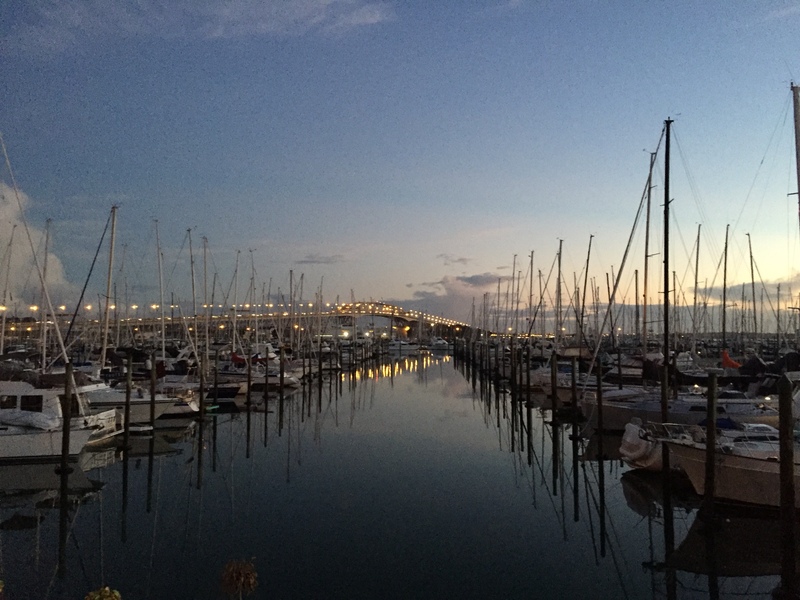 Framed by the majestic Harbour Bridge, markontour enjoyed a lovely morning jog through the Wynyard Quarter and along to the huge municipally owned marina. While the cranes get to work, you can lounge in a container-library, or enjoy the restaurants and cafes that are starting to open up in advance of the new residents. Auckland Museum has been built out in three parts over a century, a reality that has created challenges for the facilities managers who are now using an impressive building management system to try and make it more energy efficient. 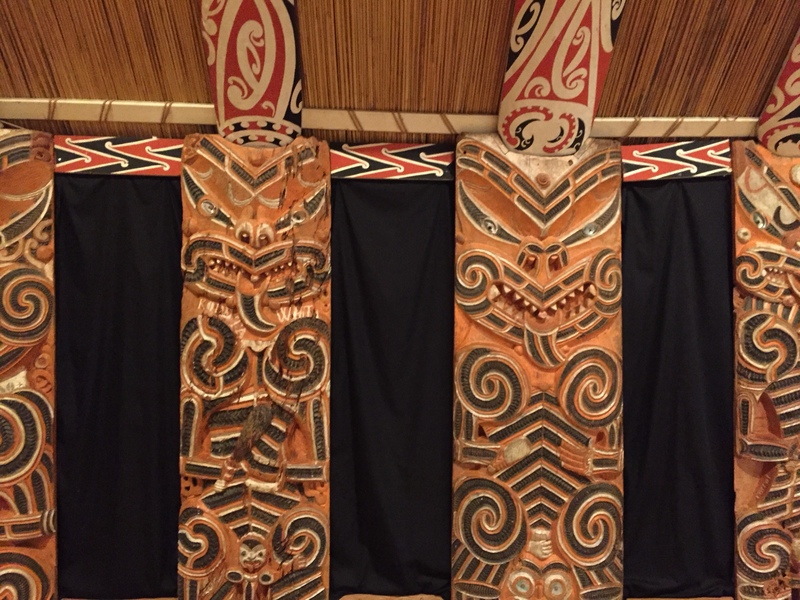 But inside it houses some fantastic Maori and polynesian art, including a traditional Maori meeting houese (Hotunui). The apparently repetitive patterns that adorn the vertical wooden panels (pictured) are each in fact unique and represent a specific ancestor, mostly those who led the expedition to discover New Zealand. It is rather nice that you can nip to the beach after work here. We enjoyed pizza to the sound of the waves as the sun went down. A top-notch eaterie at the peak of the SkyTower, which dominates the Auckland vista, the views are stunning and the food wonderful.